Even as the governments of India, Pakistan and even Afghanistan have all laid a claim on the world-famous Kohinoor diamond that is set in the front of UK’s Queen Mother’s Crown, it is Dubai that can be called home to one of the world’s rarest and largest rough diamonds even discovered. The astonishing rough diamond in Dubai is characterised not only by its sheer size – an impressive 404 carats – but also uniquely by its colourlessness and flawless clarity. The cut-down Kohinoor, on the other hand, weighs 105.6 carats. Ahmed Bin Sulayem, Executive Chairman of DMCC and Chair of the Kimberley Process, hosted a press conference in Dubai along with Fawaz Gruosi, Founder and Executive Board Member of diamond jewellers de Grisogono, to announce the latter’s acquisition of the rights to one of the world’s largest and rarest rough diamonds ever discovered. “Dubai and DMCC have become the global epicentre for the diamond trade and we are delighted to have been part of facilitating the access to one of the world’s largest and rarest diamonds by de Grisogono here at Almas – the world’s tallest diamond tower,” said bin Sulayem. “Not only does this further cement Dubai’s role as a leading diamond trading hub globally, it also highlights how DMCC connects the industry and the producing and consuming countries along the Silk Road,” he added. 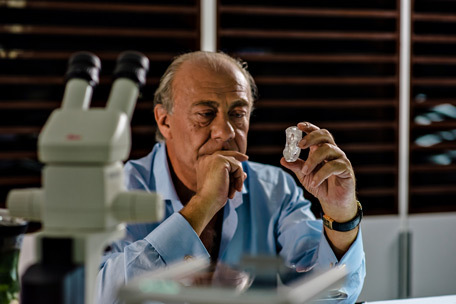 One of the 30 largest top quality rough diamonds ever found, and the largest ever found in Angola, the diamond weighing 404 carats will now be cut and polished by de Grisogono’s cutters. While Kohinoor was much bigger at 793 carats when it was first found, it was repeatedly cut and polished over the years to achieve its dazzling oval-cut brilliance. Even now, at 105.6 carats (21.12 g) and measuring 3.6cm x 3.2cm x 1.3cm, the Kohinoor’s cut is far from perfect by modern standards. Its culet is unusually broad, giving the impression of a black hole when the stone is viewed head-on. On the other hand, DMCC along with jewellery-makers de Grisogono have the perfect opportunity to craft the recently discovered diamond into “one of the most beautiful jewellery pieces ever created”. Contrary to the traditional process, where jewellers are restricted to the polished stones that already exist in the market, with this partnership, de Grisogono will have the opportunity to bring a jeweller’s perspective into the cutting process, maximising the beauty of the final jewellery pieces. 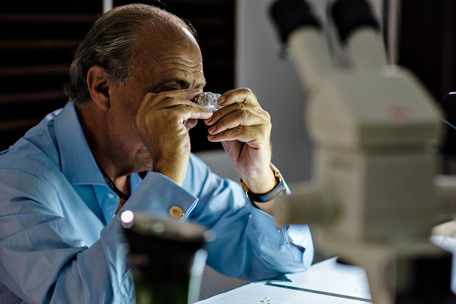 de Grisogono has partnered with Nemesis International, a leading rough diamond trading company based at the DMCC, which works on a day-to-day basis with the best diamond mines in world to identify, select and acquire the most precious diamonds in existence. DMCC’s Almas Tower, purpose-built for the diamond industry and one of the most influential diamond trading centres in the world, provides a leading platform for such a significant acquisition. “This diamond marks one of the most important milestones in my career both as a jeweller and a designer. Words cannot express how grateful my team and I are to DMCC and Nemesis International for such a unique collaboration,” said Fawaz Gruosi.